Moments after he backflipped for teammates he found out his fiancee was in labor. 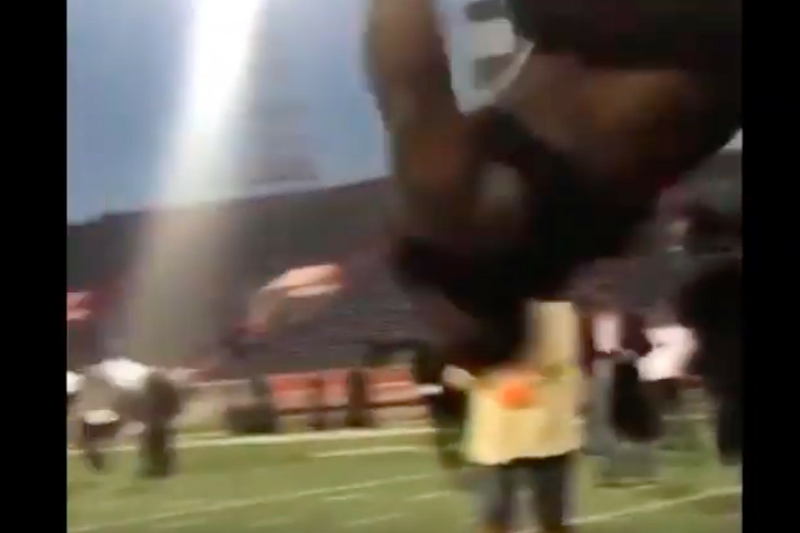 Western Illinois’ Khalen Saunders stunned onlookers at Day 1 of Senior Bowl practice when he dropped a backflip you never thought was possible by a 320 pound man. This isn’t anything new for Saunders, who has been backflipping for YEARS and astonishing onlookers — but this is only part of the story. Moments after this video he received a call from home that his fiancee was going into labor back in Chicago. “She calls me and she’s like, ‘I’m feeling light-headed,’ and all of this kind of stuff,” Saunders said. “She’s felt light-headed before; it just comes with being pregnant. Next thing I know, I was on Snapchat and I see her in scrubs in the hospital bed. I FaceTimed her immediately, like, ‘Hold on, you said you were feeling light-headed, you didn’t say this.’ She was in the hospital. Saunders and his fiancee discussed his difficult decision, ultimately deciding he should stay for practices and try to make an impression while he was there. Saunders plans to leave before the Senior Bowl on Saturday, so he can get home to meet his child. Now that’s something to backflip over.